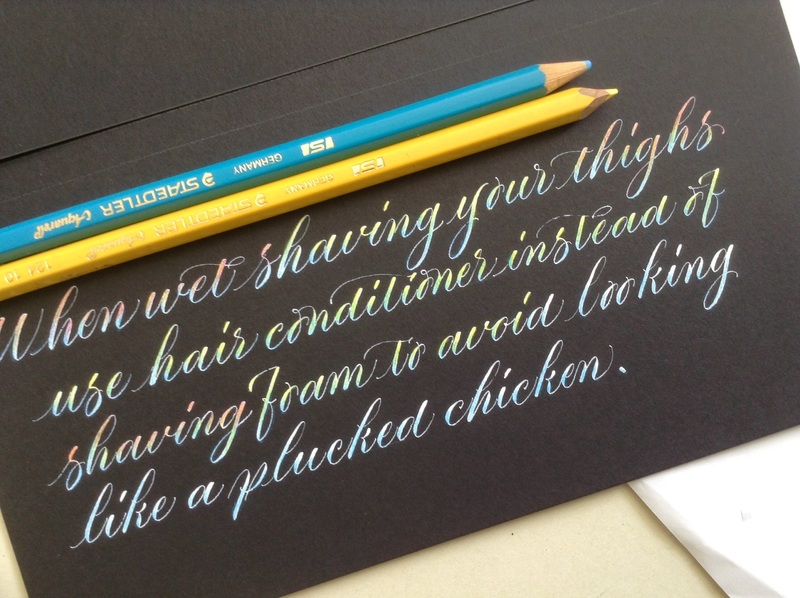 …and not only a calligraphy tip, but also a beauty tip!!! A double tipped post!!! What could be better???? Apologies. I am a little fraught, having spent the morning trying to sync my wretched devices. They have decided that they hate each other and are refusing to share anything… especially photographs. I have tried talking rationally to them, but in the end I resorted to tricking them into doing what I wanted them to do. I am female, so it wasn’t that difficult… but they shared the relevant information very slowly. Anyhow, what was the calligraphy tip??? Oh yes…. 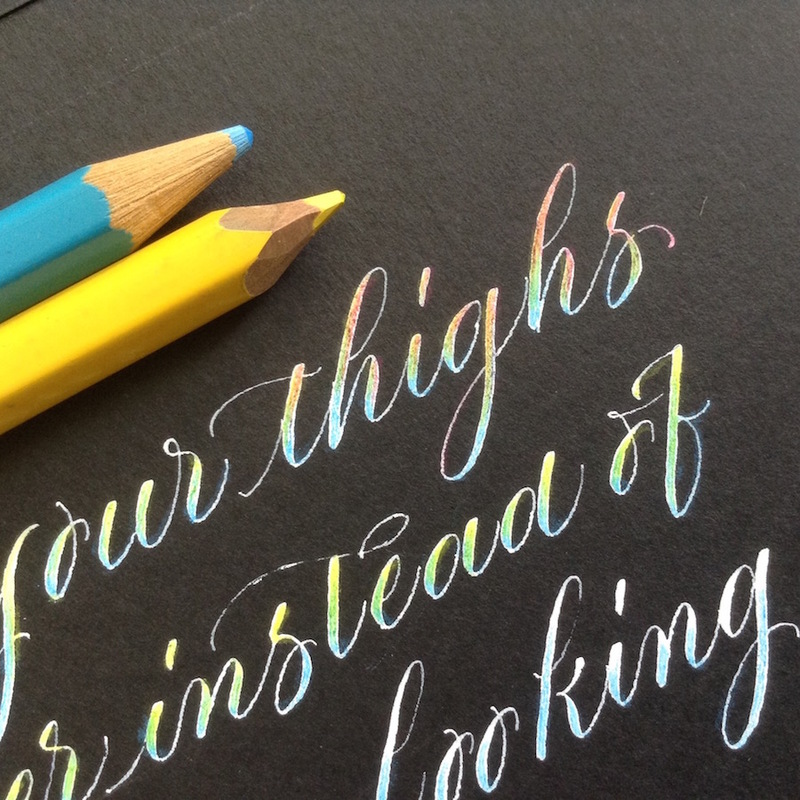 if you would like to add some subtle colour to white calligraphy simply colour it in with coloured pencil… just make sure that the white is proper dry before you do, or it might get a bit messy. 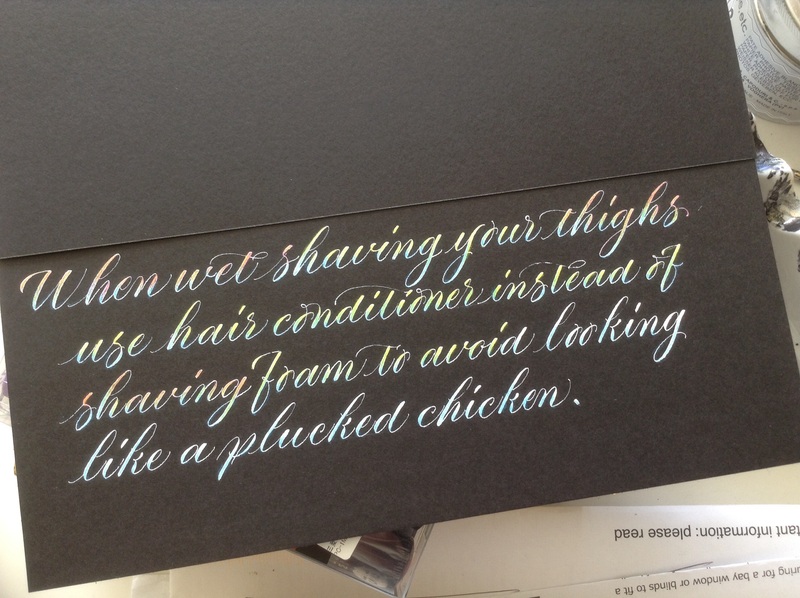 This entry was posted in Calligraphy and tagged beauty tip, calligraphy blog, calligraphy tip, copperplate, no plucked chickens here on August 12, 2015 by Scarlet. That really is very clever. I’m not much good at all that synching stuff so I’m pleased you didn’t ask for my help as head of the south wormhole technical society. Oh Mr Ducks, these devices have given me such a headache! To be honest the calligraphy took less time than the technology. I have searched the internet for an answer… it seems I’m not the only one with rebellious devices. I belong to the Abacus Society myself. But! Beautiful color to your words of wisdom on beauty culture. Yes, Grouchy Dearest, but I used to get in a muddle with an abacus… if there’s a muddle to be had, I’ll find it. My words have an attractive blush today! Thank you! Fortunately, I have blonde thighs, so I’ve never had to shave them. Actually, looking again, I’m not only blonde but also nearly hairless there. I’m not sure if this is good or bad, I’m a bit worried now. My devices are pretty friendly on the whole but, whilst my phone calendar shares info to my iPads, they keep information to themselves, which is a nuisance. I have to do it via the computer and sometimes I think there are too many devices. Do not worry about your thighs, dear Z! I used thighs to pique the interest of Mr Lax and Mr Mags! We shall swiftly move on from thighs, and I will continue wailing about my tech issues from which I still haven’t recovered. I have no idea why my iPad is now sending my pictures to the iPhotos library… and not the Photos application like it was doing…. until the 13th July. Aaaarrgh, it’s driven me crazy. Men are just as good at tricking people into doing things. It’s called politics, ha ha. I like the subtle colour effect. And I’ll bear the advice in mind next time I’m shaving my thighs. Oh hang on, I’m a bloke. Do not used hair conditioner on your face, Nick! Apparently this doesn’t work…. I have no idea what happens…. but don’t do it! Dinah, I don’t think I’ve ever sharpened the blue pencil! Do you think there are advantages in using the “proper” or more traditional way in pencil shaping, DInahmow ? I confess that I happily bought a sharpener some years ago. There is no way back to the “Federmesser” ! Control of the lead…. we all need control over the lead in the pencil. I love it! 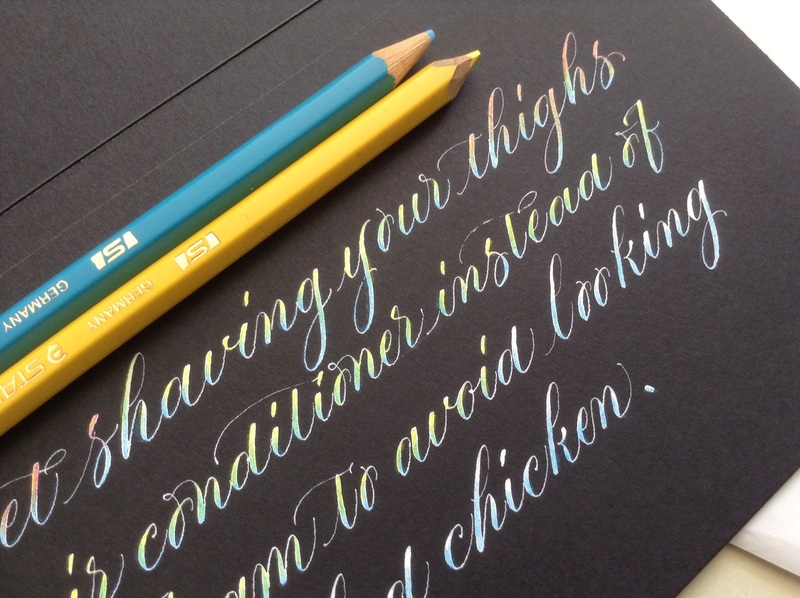 The calligraphed beauty tip, that is. Especially the sheer elegance of the crossed ‘t’s – beautiful! As to your troubles with DeVices; we’re a funny lot and don’t tend to get along when in close proximity to each other. I would have thought a long term reader like yourself would have known this by now? I always think of you as the Devines! But I see what you’re saying. Elegantly scribed beauty tips might be my new thing; I have plenty to say about eyelashes; I know how to strip varnish from doors with moisturiser, and, of course, there is my in depth knowledge regarding the Infomaniac butter stick treatment…. I could write a book…. Then I’ll be first in the queue for a signed (elegantly scribed, of course) copy! Is it Wednesday already? I think machines talk to each other and plot. I saw an advertisement on the telly the other night, a woman was washing her hair and face with shampoo, it came with a warning advising viewers not to shampoo their eyes! I was heavily medicated at the time so I could have imagined it. I love the colours too it looks like mother of pearl or mother of Scarlet. Yes, Ms Carte, this is why I don’t allow my phone to talk to the other devices… they would all start plotting and my secret most private photo album would end up on Flickr, or worse. I’m thinking the thighs tip would work with chicken as well! So, triple points on this post! Indeed, Mr Lax! Rub the chicken with hair conditioner before plucking! Worth a try. Then you’d need loads of sage-and-onion to mask the flavour! There must be something in the air. My phone has stopped sharing photos with my laptop, it’s very annoying. I’m going to do what I always do – ignore it until the frustration gets too much. Oh and thanks for your answer on last post. I’ve been doing drawing practice – Os and wondered whether I was doing them right. Also, excellent beauty advice…I may follow it…or not. Yes, Ms Roses…. the world of Apple has gone pear shaped…. very, very annoying. I will keep looking for answers because I’m already frustrated. The colouring gives a nice touch, but I think it needs to be done in all carefulness. Did you use a Ratzefummel afterwards ? All this could do harm to the white ink, and result in more crumpled balls. I am liking the sound of Ratzefummel, Mr Mags! Whatever it is I think I need to use it…. is it like hairspray…. which can double as a fixative? Oh, it’s only a word for a rubber. I see no strokes of the pencils on the paper, so I wondered if you may have used a rubber ? I used a soapstone pencil for the guidelines… which erases easily on dark paper, much better than ordinary pencil…. so long as the white writing has plenty of time to dry, then all is well. 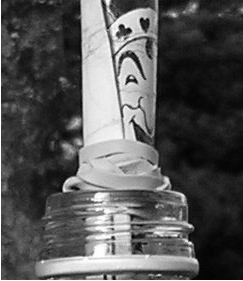 I will took about the uses of rubber cement in a future post… possibly Calligraphy Tip 22. Reblogged this on Art Whisper Photography. female trickery – now that’s an art that would be difficult to put into an app. Now what if you already have chicken thighs? BTW – are women still called birds in the UK? I recall learning that from the Beatles. No, they’re not called birds any more, thank goodness. Or chicks. But Northern Irish women are always called girls, even if they’re 103! Yes, Bill, British women are still called birds… and plenty of other things! Although the term is decreasing in popularity. Due to men getting things thrown at them. The result is fantastic but it looks like an incredibly tedious task. Is it as difficult as it looks? You’ve never posted a picture of your hands. Can you pose holding one of those colo(u)r pencils? Females are devious. Good that you acknowledge it. I’ve been tricked into many, many, many, many things I wanted nothing to do with only because of a soft voice. Works every time. I am practicing my soft voice, Monsieur Pain…. I am more of a squawker… and when I try to be softer I get accused of mumbling! 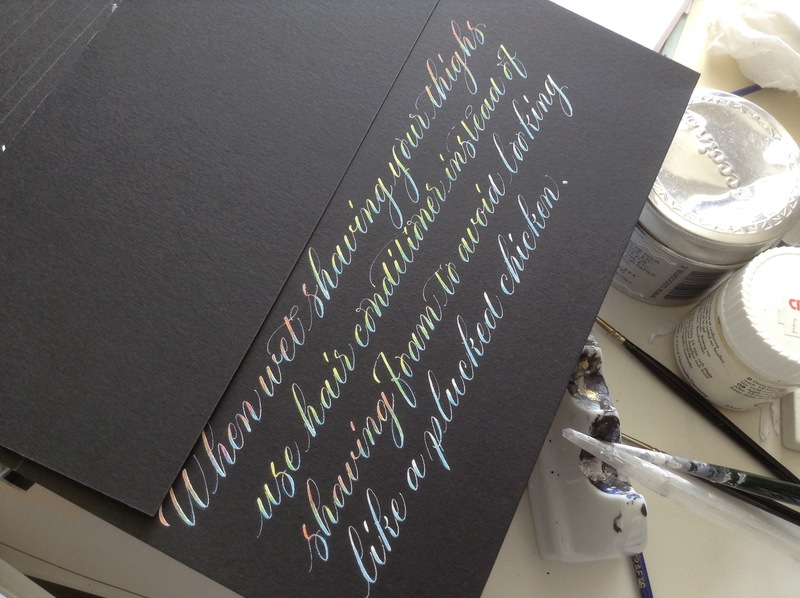 This is not a tedious task, nothing about calligraphy is tedious…. other than ruling guidelines… colouring the lettering is surprisingly relaxing and quick. World’s most economical therapy lesson. I could have used that info a decade or two ago. A dual tipped post from Wordy Wonk. Blimey Kate, my stats have gone through the roof! That’s the problem with not being on Facebook, I don’t get to see these things, thank you for the link, Kate! 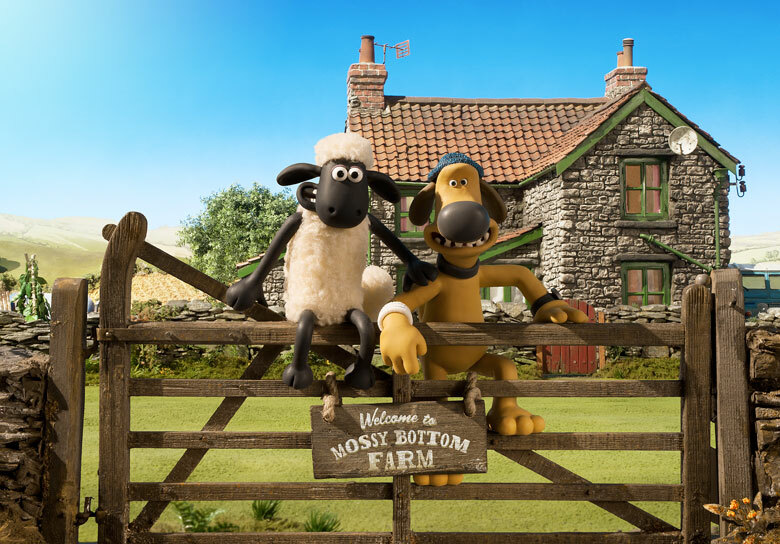 I imagine Chez Blue in a beautiful countryside setting much like Mossy Bottom Farm, except with calligraphy! Exactement, Mr Lax!!! Although there might be more rain in these parts. However you do it it is beautiful. You are very talented. AND the sax! I’m floundering since embarking on windows 10 and helpful explanations only confuse me further. Back to writing sans photies. Pinning my hopes on Tom-grandson in September.